Railing style #1. The standard railing. 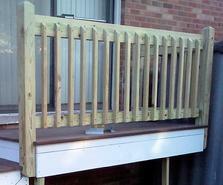 Railing style #3. Same as #2 but with chamfered posts and rail cap. 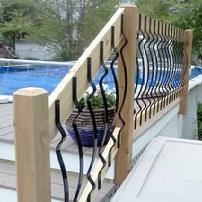 Vertical cable railing - Nice! Railing style #4. 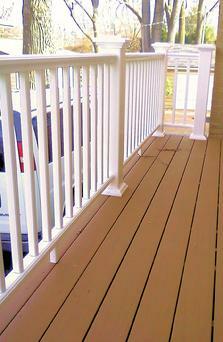 Wood rails with aluminum balusters. Click here to see the styles of aluminum balusters. White vinyl rail from Azek. Nicely constructed, solid. Expensive. 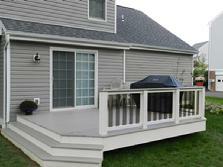 Trex, Timbertech and Fiberon railing systems are also available.